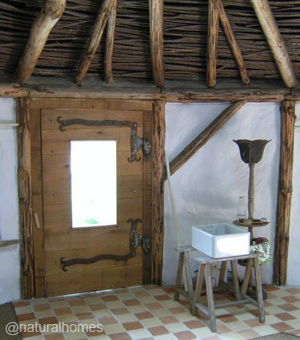 A straw bale roundhouse, step by step. There aren't many opportunities to get foundation to roof building experience on a straw bale roundhouse project. Fewer still when the builder has such a strong commitment to natural materials. This is one of the roundhouses built by Matthew. You can see the steps in its construction by clicking the buttons 1 to 9 above the picture right. 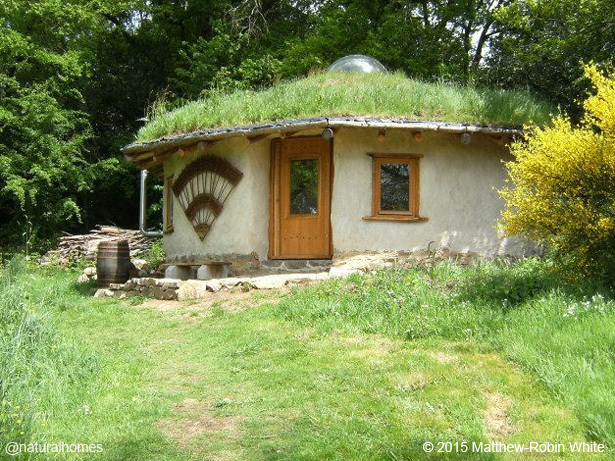 Matthew built another roundhouse just like this one for Jane in Cornwall, UK in September 2015. You can see the frame of the home here. The 7m diameter French roundhouse (6m internally) stands on a rubble trench [see picture 1] cut deep enough to reach below the frost line. This protects the building from movement in the winter when the ground above the frost line freezes and expands. The trench is filled with rubble over drainage pipes that channel out any water collected from above. A ring (often incorrectly called a henge) of debarked douglas fir roundwood, 15-20cm diameter, stands on stone pads that rest on the rubble trench  braced by six timbers to stop the frame twisting. The ring of timbers supports a reciprocal roof  that will eventually leave the ceiling height at 2.2m by the wall and 3.6m in the middle. The roof is covered with willow branches  which later support the green roof above a geo textile membrane . Traditionally a green roof would use birch bark lasting some 30-40 years. 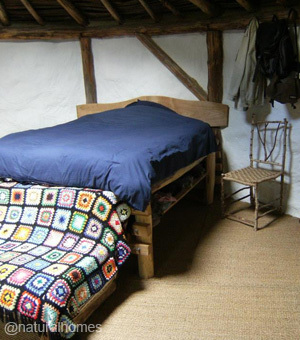 Above the geo textile is a layer of 15cm of straw insulation covered by another layer of geo textile on which loose soil, a drainage pipe  and 10cm deep turfs were laid. The stem wall  is a granite dry stone wall with earthen mortar. This raises the straw bales above the ground level (grade) protecting them from rain. The straw bales  were plastered with subsoil and lime (NHL3.5) mixed 4-5 parts subsoil to 1 part lime for the first coat and 3 parts sand 1 part lime for the second coat. The walls inside are lime washed to help lighten the interior. The floor is a limecrete mortar consisting of 2 parts subsoil, 1 part sand, 2 parts pozzolane gravel (volcanic rock a bit like pumice) and 1 part lime (NHL5) poured over a geo textile sheet resting on a 15cm deep layer of stones. 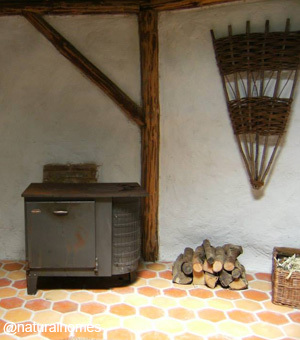 The floor was finished with earthen tiles laid and jointed with lime mortar and then covered with seagrass matting. The wood burning stove (below) gets the house warm in less than a hour which stays warm in freezing temperatures for around 15-20 hours without the fire. Like any house condensation can form on the skylight dome, but the droplets roll down to the edges and filter into the turf's soil joining the rain. It's rare that any house is built by one person and this house was no different because Matthew had help from many hands including Tony, Joe, Kristian, Sam, Ali, Edouard and Guillaume. You can see more stages in the building process here on Matthew's Facebook profile.